More Proof the 2018 Corvette ZR1 is Coming! Last weekend, GM released preliminary information on the 2018 Corvette including options, deletions, etc., but no mention of a ZR1 in any of the literature. Thanks to one of our forum members, we’re one step closer to seeing proof that the ZR1 is coming. We are told that the example Corvette being built here is a 2018 Z06. 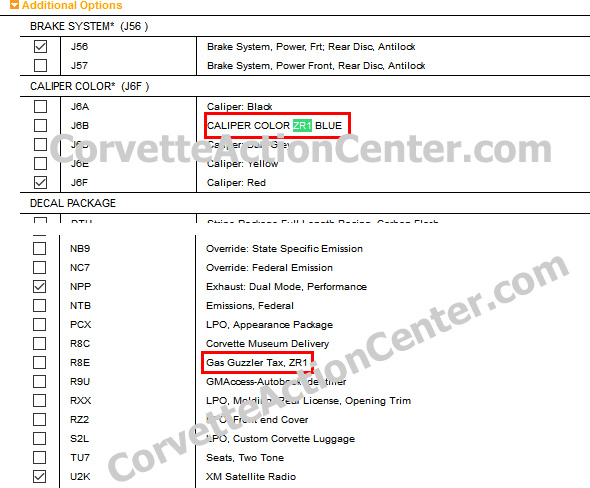 As you can see, RPO J6B CALIPER COLOR ZR1 BLUE is an option, and RPO R8E which is nothing more than a Gas Guzzler tax, is referenced with ZR1. From 2009 to 2013, the Z06 and ZR1 were always referenced together in GM documentation and model codes since the two models shared the same platform…the ZR1 was built starting with the Z06 – for all intents and purposes. When GM will officially unveil the ZR1 is anyone’s guess. Some enthusiasts are hoping it will be in a couple weeks at the National Corvette Museum’s annual Bash event. Others believe it will be in a couple months at one of the ALMS Races that GM’s Corvette Racing will be attending. The Corvette Action Center will be attending the NCM’s annual bash later this month, so we’ll bring you any updates we can get!